Use the magic of Microsoft Excel to generate countless examples, stimulate discussion, and build student confidence and competence in calculating mean, median, mode, and range. 1. Open the downloaded Excel file. 2. Click on one of the lesson tabs located at the bottom of the screen. 3. Press the appropriate key(s) to generate an example (F9 for PC; Command + Equal for Macs). 4. Demonstrate, discuss, review, and learn. 5. Then with a simple key press, generate another example. * Introductory Lessons - Generates a list of numbers and shows the steps to determine either the Mean, Median, Mode, or Range of the list. 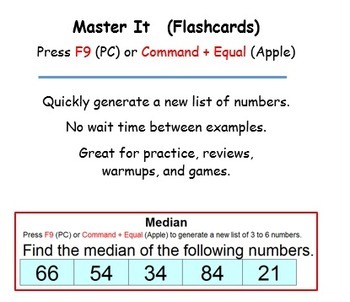 * Flashcards – Generates a list of numbers for students to practice their skills. Great for practice, warm ups, reviews, and games. * Printable One-Page Worksheets - Perfect as an assignment or a quiz. There is a worksheet specific to each skill as well as a comprehensive worksheet. * Mean - an introductory lesson showing the steps to finding the mean of a set of 2 to 6 numbers. Number values range from 25 to 100. * Mean Flash Cards - generates a list of from 2 to 6 numbers. Number values in the list range from 1 to 100. * Mean Worksheet - 10 practice problems. * Median Odd - shows the steps to finding the median in a list of 7 randomly generated numbers. Number values in the list range from 20 to 100. 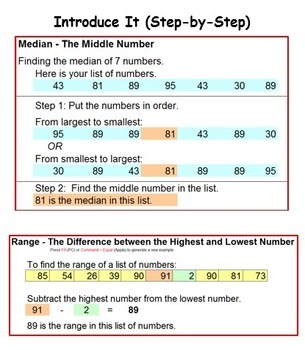 * Median Even - shows the steps to finding the median in a list of 6 randomly generated numbers. Number values in the list range from 20 to 100. * Median Flash Cards - generates a list of from 3 to 6 numbers. Number values in the list range from 1 to 100. 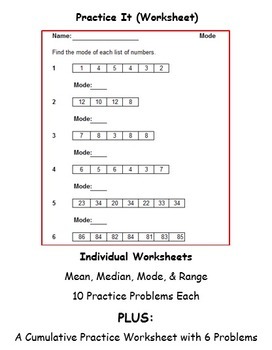 * Median Worksheet - 10 practice problems. * Mode - generates a list of 10 numbers with values from 1 to 10 for students to practice finding the mode(s). * Mode Flashcards - generates a list of 10 numbers with values from 1 to 10. * Mode Worksheet - 10 practice problems. * Range - shows the steps to finding the range in a list of 10 numbers. 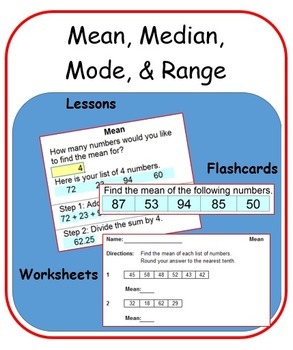 * Range Flashcards - generates a list of 10 numbers for student practice. * Range Worksheet – 10 practice problems. * Cumulative Worksheet – 6 practice problems to find the mean, median, mode, and range. * Keys for all worksheets.